On your first visit you will be asked to fill out basic health history paperwork. The doctor will review your paperwork and ask you some questions regarding your specific problem areas. 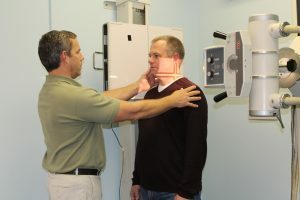 The doctor will take the necessary X-rays and perform your exam including muscle testing, range of motion, palpation, neurological and orthopedic tests. After, the exam a report of findings will be arranged where the doctor will go over the cause of your health problems and the best possibility for their correction and maintenance. If you decide to follow the recommendations you will receive your first treatment. In order to gain the benefits of Chiropractic adjustments, the doctor must first deal with the patients’ immediate pain and discomfort. By utilizing physical therapies such as moist heat, ice, electrical stimulation, massage, and ultrasound, the patients’ pain and inflammation can be minimized, allowing the doctor to deliver the corrective adjustment with minimal force and greater comfort. As pain and inflammation subside, specific stretches and exercises will be recommended, which increase mobility and strength, providing longer lasting effect and reduce the possibility of recurrence. Dr. Ranzette has found that these therapies are a vital compliment to the Chiropractic adjustment. Should you want to expedite your first visit – you can go to the “Print Forms” page on this website and download the New Patient forms which can be filled out ahead of time. Please fill them out completely as all of the information will be used in providing your healthcare recommendations.